Porsche has built the new 2014 Cayman and Cayman S with the engine just inches from the heart of the driver for an exhilarating driving experience. The all-new 2014 Porsche Cayman has been unveiled at the 2012 Los Angeles Auto Show and it's even better than we expected. The third-generation Cayman has been completely reengineered with its new mid-mounted six-cylinder flat engine. The Cayman comes in two models, the 2014 Cayman and the Cayman S. The new Porsche compact sports car is designed to deliver fun in the curves and it certainly delivers. The 2014 Cayman is powered by a 2.7-liter six-cylinder engine with direct fuel injection and VarioCam Plus that delivers 275 horsepower. With the six-speed standard transmission, it will sprint from 0-60 in 5.4 seconds with a top speed of 165 mph. The new Cayman S gets a bit more exciting with its 3.4-liter, flat-six engine with DFI and VarioCam Plus that delivers 325 horsepower. It accelerates from 0-60 in 4.7 seconds with a top speed of 175 mph. With the optional PDK and Sport Chrono package, it can reach 60 mph in a very quick 4.4 seconds. The new Cayman will certainly leave the driver anticipating the next curve. What makes the new 2014 Porsche Cayman so unique, is the mid-mounted flat six engine sits no more than 12 inches behind the driver. This translates to the new sports car having a large proportion of the vehicle’s weight near the center of the vehicle. The center of gravity is central and low and the weight is equally distributed over the front and rear axles. The new Cayman is as balanced as any sports car on the road thus delivering exceptional handling, particularly in the corners. Both the Cayman and Cayman S models come mated with a six-speed manual transmission that “provides smooth, precise gearshifts and is optimally adapted to the relevant engine characteristics.” The new sports car comes with an upshift indicator in the center round instrument that helps keep the engine at the optimum speed to lower fuel consumption. An optional completely redesigned seven-speed Porsche Doppelkupplung (PDK), automatic is available featuring both manual and automatic modes. The new transmission allow gear changes to take place while allowing optimal traction. The automatic will shift quicker than a human with the six-speed manual producing better acceleration values. The new Cayman sports car features a separate stainless steel exhaust system per cylinder bank. The Cayman dumps the exhaust into a single connecting tube and a tailpipe, the Cayman S into a twin tailpipe. For a “richer sound”, a new sports exhaust system including sports tailpipe is available as an option for both Cayman models. The body has been lowered on the new Cayman by 10 mm, and an optional PASM, an electronic system for adjusting the shock absorber system is available. The new suspension upgrade actively and continuously controls the damper force for each individual wheel, depending on the driving style and situation. Two suspension modes are available: in Normal mode the suspension is sporty and comfortable, as compared to sporty and firm in Sport mode. On the new 2014 Cayman models, the brakes feature a larger diameter 350 mm at the front and rear and the ceramic brake discs are cross-drilled for even better braking power. They come with yellow six-piston aluminum monobloc fixed calipers on the front axle and four-piston aluminum monobloc fixed calipers on the rear axle. The new brakes provide the power needed for braking from extreme speeds going into the corners. 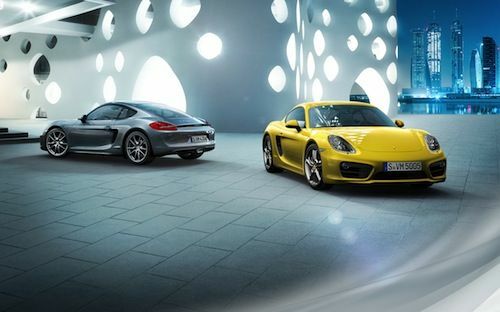 The all-new 2014 Porsche Cayman and Cayman S are designed with the driver in mind who wants extreme performance in the curves. Porsche offers the engines, transmissions, exhaust systems and the stopping power for buyers who want to go fast, and those who want to go super fast. Watch The new Cayman. First exclusive look in the video below. Test. Why are my comments not being posted? I am extremely inspired with your writing talents as smartly as with the format on your weblog. Is this a paid theme or did you customize it your self? Either way stay up the excellent high quality writing, it is uncommon to see a nice weblog like this one these days..